Freedom Forum has submitted review report on Province 5 proposed Communication Policy and submitted it to the Office of the Chief Minister and Ministry of Internal Affairs and Law on 26th September, 2018 with the objective of facilitating the Ministry in making policy decisions in the field of information, communication and freedom of expression in the changed context. 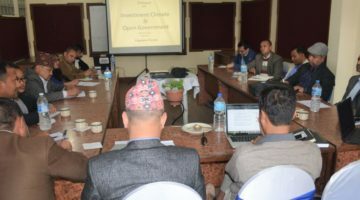 Freedom Forum representative for Province 5 Ram BikasChaudhary handover the review report to the above mentioned agencies today. Out of 68 points provision of the policy FF have recommended amendment for 44 points and identified gap and suggested other 8 points for accommodating newly formulated proposed policy. The review report of the proposed Mass Communication Policy for Province 5 is made in order to manage overall communication sector in the province. FF has reviewed the policy pointing out the provisions those are inconsistent with the constitutional and international standards, existing National Mass Communication Policy and best media practices. Similarly report has given recommendation providing the grounds for amendment for such provisions. Receiving the review report, Ministry Officials thanked FF for its initiation and assured it will be helpful while finalizing the Communication Policy.